The point he was trying to make—albeit unsuccessfully—was that one should not believe a known and documented liar. Mirror, mirror, on the wall, who’s the biggest liar of them all? One of my greatest ambitions is to count the number of lies the United States government has told the American people. From little baby fibs like Watergate and the Lewinsky scandal to giant whoppers like the NSA domestic spying program, the government’s predilection for deception is pathological, consistent, and shameless. One of the more heinous kinds of government deceptions is called a “false flag”. The semi-reliable source known as Wikipedia defines false flags as “covert military or paramilitary operations designed to deceive in such a way that the operations appear as though they are being carried out by entities, groups or nations other than those who actually planned and executed them”. In other words: governments kill people, blame the attack on somebody else, and use it as a pretext for war. False flag operations have utilized an array of lethal tactics—including (but not limited to) blowing up ships, burning down entire cities, inciting riots, and old-fashioned covert assassinations—a veritable horn of plenty of government-sponsored terrorism! So let’s first take a look at a modern version of this kind of democidal false flag operation; thankfully, it’s one that never came to fruition. The Cold War was a proxy war where the US and the Soviet Union fought for global hegemony using satellite countries like Hollywood actors use stunt doubles. In 1962, Cuba—a Communist nation only 90 miles from the coast of Florida—became the focus of the conflict. The U.S. wanted war, and they would try just about anything to achieve it. 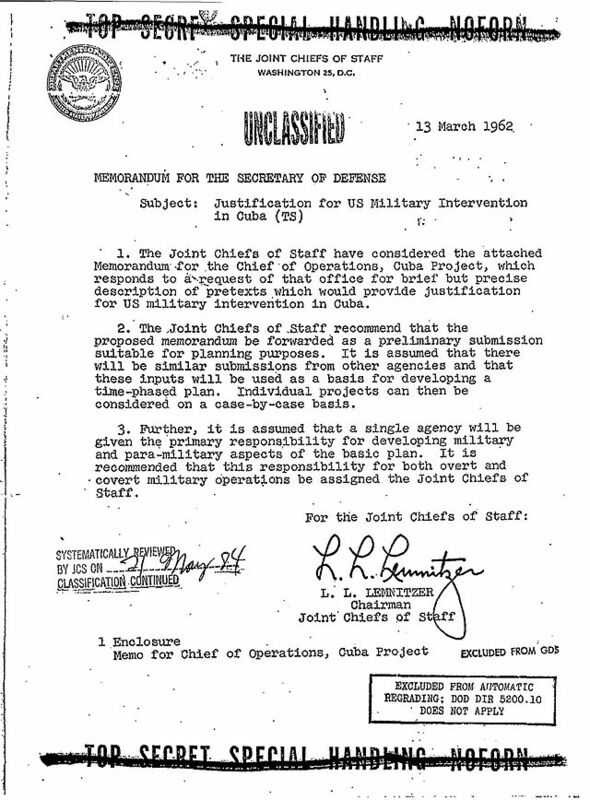 Operation Northwoods was the plot by the U.S. Department of Defense to instigate such a war. The Joint Chiefs of Staff authored the documents related to the operation. They were charged by the Chief of Operations to “indicate pretexts that would provide justification for US military intervention in Cuba.” The goal was to blame Fidel Castro and communist Cuba for the attacks, and “stir up national indignation”. Fortunately, Secretary of Defense Robert McNamara rejected the various proposals and the operation never took place. However, there are other plenty of other False Flag Operations that were executed. We’ll take a look at those next. Next articleWHAT HAPPENED TO GOOD CUSTOMER SERVICE? I did not know a lot of this I read in the story.